The appearance of a raised, hairless, and bright red "angry" looking skin lump on a young dog is characteristic of a histiocytoma. This is often alarming to dog owners, as these lumps often appear suddenly, almost overnight. Histiocytomas usually are not painful, and most dogs do not even seem to notice them, despite the fact that the lump may be ulcerated. A histiocytoma is a benign (non-cancerous) skin tumor, usually seen in young dogs, that often spontaneously regresses without treatment. It is a common tumor that can occur in any dog breed. 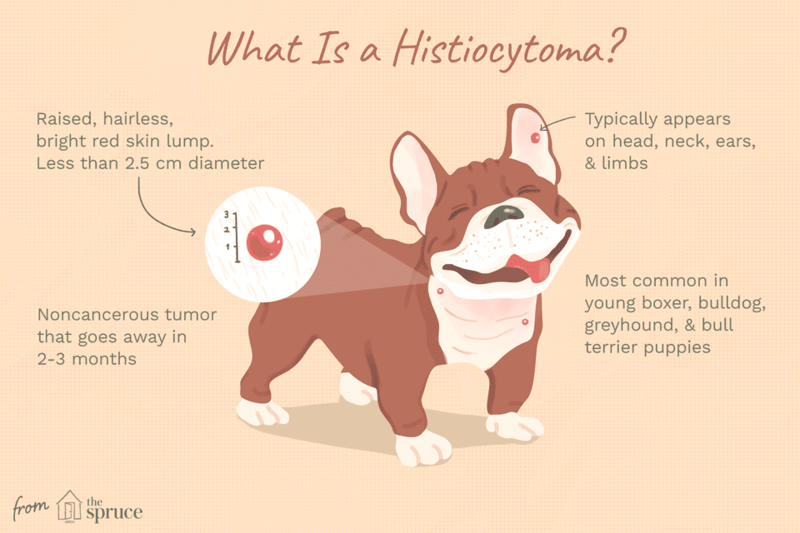 Some dog breeds, however, such as boxers, bulldogs, greyhounds, and bull terriers seem to be more susceptible to histiocytomas. It is unusual for more than one tumor to be present at once. These tumors originate in a dog's Langerhans cells, which are part of its immune system. They're also called dendritic cells or histiocytes, hence the clinical name of the tumor. Histiocytomas generally appear on dogs younger than three years old. The tumors have a button-like appearance and they are most often found on the head, neck, ears, and limbs (though they can appear in other places). Histiocytomas tend to be less than 2.5 cm in diameter. Histiocytomas are classified microscopically as a round cell tumor, but unlike cancers, they do not grow and are not dangerous to your pet. There are, however, a variety of tumors included in the round cell tumor classification, so it is important to have your dog seen by a vet. While histiocytomas are benign, other tumors in this class may be more serious. It is important to have your veterinarian check out any new lumps and bumps on your pet to be sure. Definitive diagnosis is established by examining the tumor cells microscopically through cytology or biopsy. Your veterinarian may want to wait and watch the lump, based on the age of your dog and the location and presentation of the lesion. If in doubt, a biopsy will provide an answer as to the nature of the lesion. Your veterinarian may perform a test called a fine-needle aspirate, which allows cells to be taken from the mass and examined under a microscope. It's important for a veterinarian to diagnose your pet's histiocytoma; don't try to wing it and begin treatment on your own. The reason this is especially important is that the treatment for this kind of tumor is not the same as the treatment for a malignant tumor. If mistreated, a malignant tumor can become worse; and if it's mistaken for a histiocytoma, a malignant tumor could grow and become worse. Histiocytomas are usually removed with a laser via a treatment called cryosurgery, where the mass is frozen and then cut away from the skin. For some histiocytomas, the treatment is to wait and see; many will shrink within three months if left alone. If it's still unchanged after three months has passed, that's the point at which your veterinarian will probably recommend removing it. Depending on the location of the histiocytoma, a dog may not even be aware of the tumor. Regardless, it is important to prevent your dog from licking, scratching, or biting the tumor. This will help prevent inflammation, infection, and bleeding. If a histiocytoma has been surgically removed, it's important for the incision site to remain clean and dry and prevent any rubbing, licking, biting, or scratching at the site. Your veterinarian will provide post-surgery directions on how to care for the wound. Be sure to let your veterinarian know if there is any significant swelling, bleeding, or open stitches. Do Histiocytomas Provide Any Risk to Humans or Other Pets? There are no risks to people or other pets from histiocytomas. They are not contagious and cannot be spread from skin to skin contact. If you suspect your dog has a histiocytoma, it's best to speak with a veterinarian, who can quickly provide you with a diagnosis and a treatment plan for your dog.